The Walden West pond is hopping -- literally! This afternoon around 3pm the pond's resident bullfrogs, who normally just float quietly in the scum on the surface, would suddenly hop out of the water for no obvious reason, then settle back down a few feet away. One pair was apparently mating like that, the larger frog hopping onto the back of the smaller frog, then immediately off again. And the pond was full of sound, sometimes with two or more frogs booming at once. Bullfrogs in stereo! I didn't have the SLR along, but some of the frogs were close enough (and calm enough not to submerge when we got near them) that I was able to get a few decent shots. But I really wanted to capture that sound. So I put the camera in video mode and shot a series of videos hoping to catch some of the music ... and did. They sound like this: bullfrog (mp3, 24kb). Despite the title of this entry, the recording doesn't have any interesting stereo effects; the only microphone was the one built in to my Canon A540. It did okay, though! You'll just have to use your imagination to place two frogs as you listen, one 20 feet to the left and the other 15 feet to the right. I added that -af volume=15 argument to make the sound louder, since it was a bit quiet as it came from the camera. So that's why they call them Bullfrogs! We were heading past the scum pond at Walden West for a quick afternoon hike when I heard Dave, just ahead of me, make a very loud and very rude noise. Or maybe not. He immediately turned around and asked, "Was that you?" I insisted truthfully that it wasn't. Weird! We walked on, and behind us we heard more odd noises -- sometimes like machinery, and sometimes like a cow bellowing. We figured it was part of the summer school at Walden West -- maybe they bring in barnyard animals to show the kids. But the cow bellowing was still going on when we got back to the car, and we could tell now it wasn't coming from the school. It was coming from the pond. 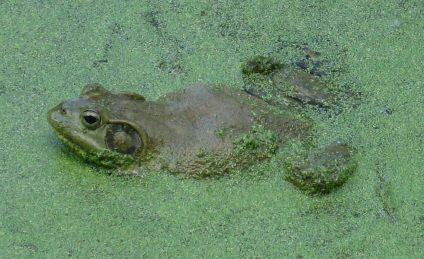 A thought occurred to me -- "What do bullfrogs sound like? Like, maybe, a bull?" I had to go see. 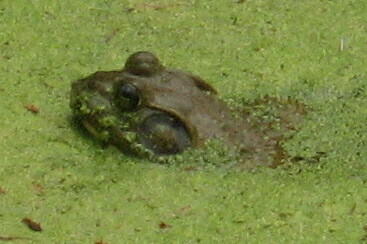 Sure enough, the green, scummy pond was covered with big frogs! 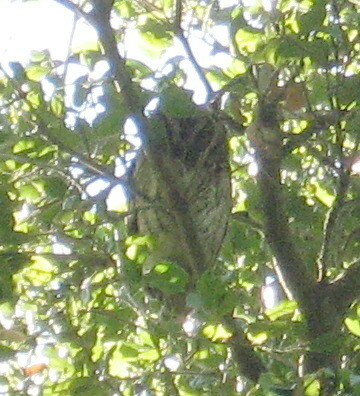 I counted about 9 visible at any one time. Mostly they were just floating in the scum, but every now and then one would bellow, or dive and swim somewhere else. Mostly they ignored us ... except the ones near the edge of the pond. If we tried to walk up near them and look down on them, they disappeared underwater immediately. Maybe we looked like a heron or egret. I know I'm supposed to hate bullfrogs. They're an invasive species with a voracious appetite for local species. My bio teacher told us to kill them on sight if possible (not that we could have done so here even if we'd wanted to). But I found it fun and unusual to see any frog at all here ... let alone a frog chorus right in front of us in broad daylight.